TBH, I’m glad we didn’t come back to this town, except to touch on its fate a bit in one quick cameo from Peter the Blest. Some endings are better left alone, and some wrongs can’t be put right. 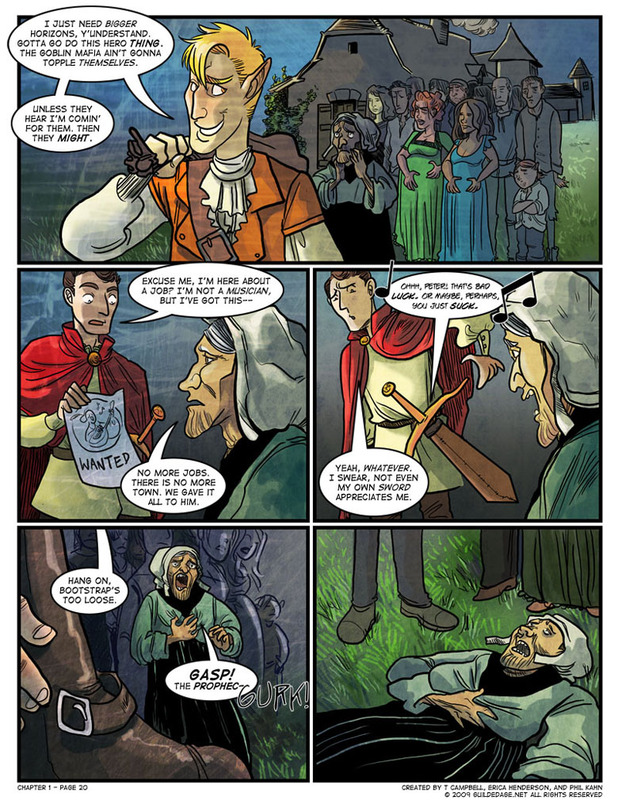 Best’s reference to the goblin mafia, like the “unicorn flu” bit on page 5, was an airy throwaway idea I came up with on the spot, just to suggest the kind of adventure Best might have, but Phil followed up on it with a story we marketed as a bonus for “Guilded Age Volume 0.5,” which also featured chapters 1 and 2. We printed two hundred of these (I have one copy left) though getting them picked up before our Chicago convention was a bit of an adventure of its own. More on that later. “Payet Best: The Art of Single-Handedly Crushing A Goblin Mafia Uprising” later appeared as part of Guilded Age Plus, but our marketing specified that the story would never appear on the main Guilded Age site, and I still feel bound by that. Not sure where I’d insert it anyway: chronologically, it’d go between chapters 1 and 2, but it’d mess with the pacing to leave so much else dangling while we focused on Best for a week. Anyway, it’s a simple tale, mostly distinguished by the first appearances of Don Gobligno and Gondolessa. 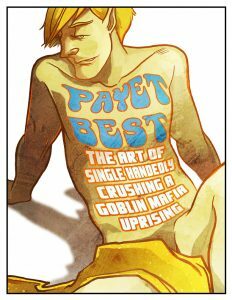 Best makes a dashing escape and humiliates his goblin captors, but if anything, that humiliation would make the goblins more inclined to unite with Gondolessa and the alliance whom Gondolessa represents. Bad news for Gastonia and its allied races, the ones Best supposedly defends. Focusing more on superficially “heroic” performances than actually helping people? Yeah, it didn’t take him long at all to get his routine down. To be fair, apparently the prophecy was a bit stretchy. To be fair they were dumb enough to believe it. But 50% of this is still on Best. He did leave behind a legacy or two. It took me till the second run to realize why the bootstrap comment was important. Ah, yes! So that’s what a “strapping” hero is! Prophetic compulsive disorder is a helluva thing.